There will be a general meeting tonight at the Days Inn at 7:30. This will be our first meeting after our first race of the season. All are welcome and hope to see you there! We had an amazing afternoon for our first races of the season! A very special “thank-you” to all of our race day sponsors: Air Seeder Hopper & Nelson Motors, our officials, announcers, drivers and their pit crews, our volunteers, and of course, our fans. Modifieds Class – $1300 to win, Stock Class – $700 to win, and for the Weatherford Hobby Stock Class – $500 to win. With less than two weeks until our first race day, we have made the 2015 Driver Profile forms available here and will be sending out emails to those that provided email addresses on last years form. If you have not received an email, and would like to be added to the list, please let us know by sending us an email. Click this link for the 2015 Driver Profiles Form PDF. Please complete the form and scan/email it back to info@estevanmotorspeedway.com with the subject line DRIVER PROFILE. ** Don’t forget to include your driver and car photos. This information is needed for the announcers, speednet, and marketing etc. Please take a moment to complete these BEFORE race day so that you can focus on getting your cars ready for the track and we don’t have to hold you up at the pit gate! 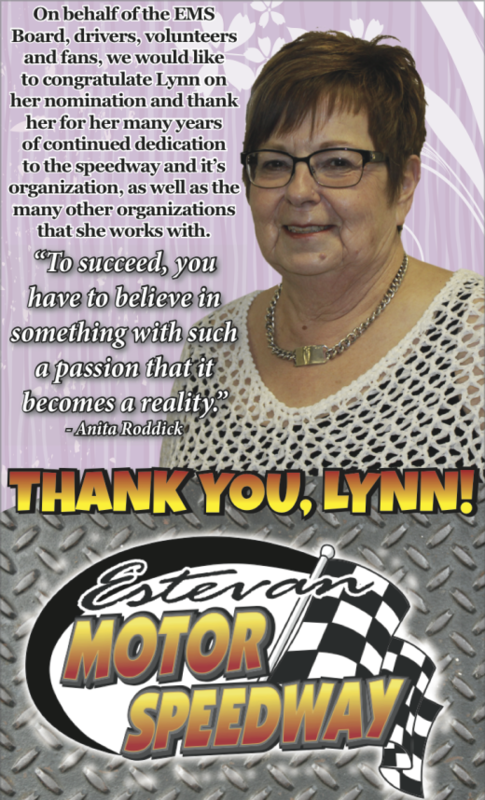 Please join us in a HUGE shoutout to Lynn Trobert, President of the Estevan Motor Speedway Organization. Lynn has been nominated by her peers for an award based on her years of hard work and dedication to our community. The 17th Annual Women of Today Awards will be held here in Estevan on April 22 where Lynn will be recognized. 2015 Season tickets are here! Our tickets for the 2015 season have been printed and are here. Soon you will be able to pick up your tickets in advance at Murray GM in Estevan (801-13th Ave) and save yourself $2/ticket. Also, if you haven’t “liked” our Facebook page yet be sure you do in order to stay up to date and take part in any upcoming contests/promotions. Join us for EMS Clean Up Days! Hey everyone – our EMS Clean Up Days are April 11th and 18th starting at 10 am to help us get the track ready for the 2015 season! We are looking for volunteers and fans that can come out and help us with this “spring cleaning”. This includes prep of the track, painting, picking up trash, rocks etc. If you need any further info, feel free to email us at info@estevanmotorspeedway.com. We are so very excited to announce that on August 15 we will have the Northern Thunder Dirt Late Models Tour at our track!! We’re only 5 weeks away from our 2015 season and the anticipation is building. We have a handy graphic here attached which gives you all the big event dates for the year. 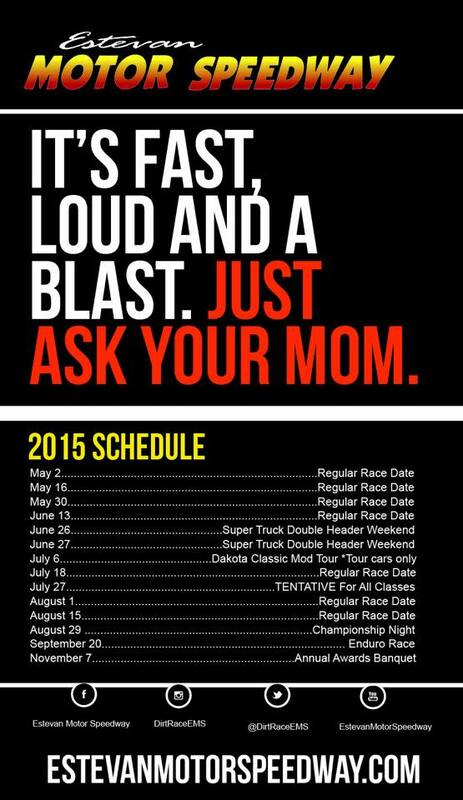 Make sure you check out our Race Schedule page for more detailed information on each event. Seeing more snow than dirt! When you start to see more dirt than snow, it’s a great thing!